Citation: Krishnan JA, Gussin HA, Prieto-Centurion V, Sullivan JL, Zaidi F, Thomashow BM. National COPD Readmissions Summit: Integrating COPD into patient-centered hospital readmissions reduction programs. Funding Support: The COPD Readmissions Summit was supported in part by the American Association for Respiratory Care and the Rhode Island State Nurses Association. The Summit webcast was sponsored by Sunovion. In 2012, the Centers for Medicare and Medicaid Services (CMS) launched the Hospital Readmissions Reduction Program (HRRP) to reduce the risk of hospital readmissions in patients hospitalized for acute myocardial infarction, pneumonia, or heart failure. In 2014, the CMS HRRP was expanded to include hospitalizations for COPD exacerbations. The CMS HRRP uses financial penalties to motivate hospitals to develop, test, and implement quality improvement programs to reduce avoidable hospital readmissions within 30 days of hospital discharge. The CMS HRRP financial penalties can be as high as 3% of hospital-specific Medicare payments for all discharges, not only payments related to the excess readmissions. In October 2013, the COPD Foundation convened a multi-stakeholder National COPD Readmissions Summit to discuss readmissions in patients hospitalized for COPD exacerbations and the potential implications of adding COPD as a penalty-sensitive condition for the CMS HRRP. In this report, we summarize the discussions and recommendations from this Summit. 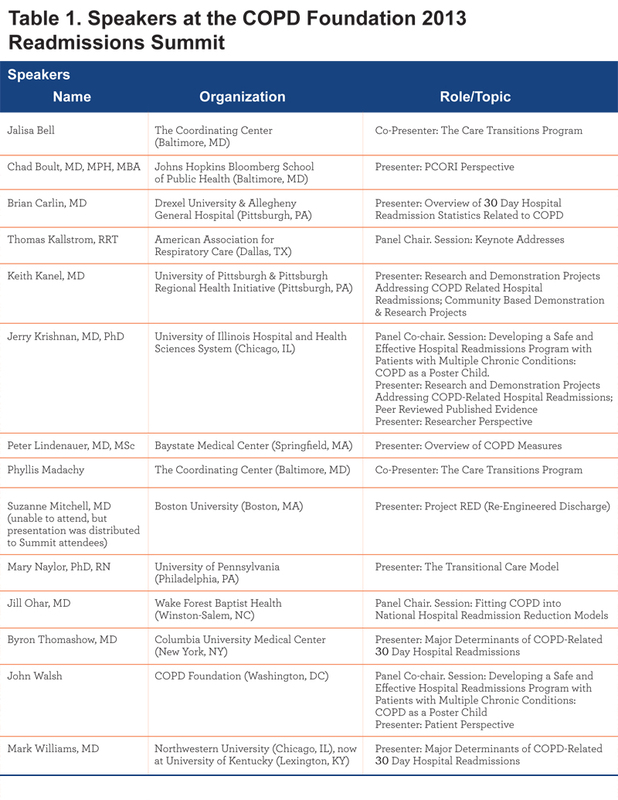 The COPD Foundation established a planning committee to identify potential speakers (Table 1). The Planning Committee invited representatives of several evidence-based programs designed to reduce hospital readmissions (Project Re-Engineered Discharge, Transitional Care Model, The Care Transitions Program, and Project Better Outcomes by Optimizing Safe Transitions).9-12 The Planning Committee also invited experts on the HRRP and interventions to reduce hospital readmissions in patients with COPD exacerbations. A representative of the Patient-Centered Outcomes Research Institute (PCORI) was invited to discuss the role of PCORI in funding studies addressing the expressed needs of patients and caregivers regarding hospital readmissions. The workshop included in-person and online participants, who were encouraged to pose questions to the speakers. Over 225 participants attended the National COPD Readmission Summit, representing over 65 organizations. A diverse group of individuals participated in the Summit, including patients, clinicians, health service researchers, policy makers and representatives of academic health care centers, industry (pharmaceutical, durable medical equipment), and payers. Analyses of billing data from over 190,000 hospitalizations in 15 states in the United States indicate that the all-cause (i.e., for any reason) 30-day readmission rate is 20.5% (with considerable variation across hospitals). Only about 1 in 3 of such readmissions are related to COPD.16 The majority of readmissions at 30 days appear to be related to deteriorations in co-existing conditions including cardiac, renal, and gastrointestinal disease, as well as concurrent infections (e.g., pneumonia).16 These findings suggest the need for adequately addressing co-existing conditions in the hospital and in the post-hospital period. Among patients hospitalized for COPD exacerbations, the risk of 30-day readmissions is higher among patients living in areas with lower income (1.4% absolute risk increase in patients living in the lowest versus highest quartile of household income) and among blacks (4%, 2.7%, and 2.6% higher compared to Asians/Pacific Islanders, Hispanics, and whites, respectively).16 These findings suggest that reducing hospital readmissions will require not only improving access, quality, and coordination of care post-discharge, but also resources linked to socioeconomic status (e.g., affordability of out-of-pocket costs of prescription medications; availability of transportation to appointments after hospital discharge; Table 2). These considerations highlight the disproportionate challenges that hospitals serving vulnerable patient populations will face when implementing programs to reduce hospital readmissions. In October 2012, the CMS HRRP began imposing financial penalties for hospitals with greater than expected all-cause readmission rates in patients hospitalized for 3 conditions – acute myocardial infarction, heart failure, and pneumonia. Beginning October 2014, CMS expanded its HRRP to also include hospitalizations for COPD exacerbations and hospitalizations for elective total hip or knee arthroplasty.51 All unplanned readmissions that occur within 30 days of hospital discharge, even those unrelated to the initial hospitalization, are included in the calculation of the 30-day readmission rate. Planned readmissions (e.g., for bronchoscopies that are scheduled to take place over 2 or more different hospitalizations) do not contribute to the 30-day readmissions rate. The CMS model for establishing the hospital-specific expected 30-day readmission rate adjusts for both hospital-level and patient-level confounders (age, comorbidities). Of note, race and other factors such as socioeconomic status are not included in the modeling, which is of particular concern since several studies have documented the role of socioeconomic resource-related factors in the risk of excess readmissions. The penalties are expected to be up to approximately 1% for all CMS payments for hospital discharges in FY 2013 (October 1, 2012 to September 30, 2013), approximately 2% in FY 2014 (October 1, 2013 to September 30, 2014), and approximately 3% in FY 2015 (October 1, 2014 to September 30, 2015). More details about the calculations can be found on the CMS HRRP website.51 For FY 2014, more than two-thirds of the almost 3500 hospitals nationwide that are subject to the HRRP will be penalized, with 15 institutions expected to receive the full 2% penalty. In summary, these 4 programs can help to reduce unplanned readmissions by promoting adherence to evidence-based clinical practice guidelines, medication reconciliation, promoting patient self-management skills, and facilitating hand-offs during the transition from hospital to ambulatory-based care. BOOST, Project RED, Care Transitions Model, and the Transitional Care Model all include a phone call after discharge to assess adherence and complications. The Care Transitions Intervention and the Transitional Care Model also include nurse-led home visits to extend the period of hospital-based care into patients’ homes. However, none of these programs include interventions-specific to patients with COPD, such as how to teach self-management skills unique to patients with lung disease (e.g., inhaler technique; use of supplemental oxygen, participation in pulmonary rehabilitation) or addressing co-existing conditions that commonly complicate the management of patients with COPD (e.g., how to differentiate dyspnea from heart failure versus worsening COPD; how to address adverse effects of medications used to treat COPD exacerbations on co-existing conditions). While patients with COPD were included in the published studies evaluating the 4 programs, results were not presented stratified by diagnosis at the index hospitalization, so it is unclear if the overall intervention effects were also observed in patients hospitalized with COPD exacerbations. A recent systematic review70 identified 5 randomized clinical trials evaluating interventions to reduce readmissions following COPD exacerbations.71-75 These trials examined a range of different interventions, including discharge planning, disease education, health counseling, inhaler use teaching, development of an action plan, smoking cessation counseling, assessment of comorbidities, referral to pulmonary rehabilitation, use of a transition navigator, and follow-up home and/or telephone-based visits after discharge. Each study examined a different subset of the interventions above. Two of the 5 trials (1 conducted in Canada and 1 conducted in Spain and Belgium) showed a decrease in all-cause readmission over 12 months in the intervention group vs. comparator group (mean number of hospitalizations per patient: 1.0 vs. 1.8, P=0.01; percentage hospitalized: 45% vs. 67%, P=0.028, respectively).72,74 The only clinical trial conducted in the United States found a greater than 2-fold higher risk of mortality in the intervention group (17% vs. 7%, P=0.003), but no significant difference in readmissions.71 The other 2 trials failed to detect differences in readmission rates between groups. There was substantial heterogeneity in the design, measurement, and reporting of study results, precluding a formal meta-analysis. None of the trials were designed to examine the effects of care transition strategies on 30-day readmission rates; all focused instead on outcomes at 6 or 12 months. This review concluded that there is inadequate information to recommend COPD-specific interventions that can be used to reduce the risk of 30-day readmissions. Various institutions are implementing strategies to reduce readmissions in patients hospitalized for COPD exacerbations. The Pittsburgh Regional Health Initiativein Pennsylvania conducted one of the nation’s first regional collaboratives of medical, business and civic leaders organized to address health care safety and quality improvements.76 In Phase 1, the program involved using an inpatient COPD nurse care manager to coordinate the care of patients with COPD upon discharge. To account for the significant overlap between the patients hospitalized with COPD and/or heart failure, the program evolved to create Primary Care Resource Centers (PCRC) in Phase 2. In Phase 2, the intervention involves a pharmacist for medication reconciliation, motivational interviewing, high-hazard medication focus and phone calls to patients within 72 hours of discharge, and nurse care managers to engage and educate patients and caregivers about self-management, conduct analysis of root cause for patients who are readmitted, and coordinate care with ambulatory providers. The program includes a home visit within 7 days of discharge and longitudinal care coordination. Compared to the period before implementation of the Phase 2 intervention, the post-implementation period was associated with a significant reduction in all-cause 180-day readmission rates (relative reduction approximately 47%). With the success of this first center, the health system received a $10.4 million award from the CMS Innovation Center to create 6 more PCRCs at community hospitals in Pennsylvania and West Virginia from 2012 to 2015. The Jesse Brown Veterans Affairs Hospital in Chicago, Illinois implemented a Recovering Obstructive Lung Disease (ROLD) post-discharge clinic in 2013. The ROLD clinic consists of 3 outpatient visits over a 4-week period, with the first visit scheduled within 1 week of hospital discharge. The patient’s first clinic visit is scheduled by the discharge team, prior to the patient’s discharge from the hospital. The ROLD clinic is built on an integrated care clinic model, involving a team of physicians, nurses and nurse practitioners, palliative care specialists, social workers, and pharmacists. Key elements of the ROLD clinic include (1) a standardized history and physical examination, use of validated tools to assess patient-reported health (COPD Assessment Test), spirometry to confirm the COPD diagnosis and classify COPD severity , and evaluation of supplemental oxygen requirements at sleep, rest, and activity; (2) literacy-appropriate education (general disease education, trigger management, inhaler technique teaching, use of supplemental oxygen equipment); (3) optimization of medical therapy for COPD and medication reconciliation; (4) smoking cessation advice and referral to a smoking cessation clinic; and (5) coordination of referrals to pulmonary rehabilitation programs and other follow-up care. Compared to the 12 months prior to the ROLD clinic, the all cause 30-day readmissions rate for patients hospitalized with COPD exacerbations has dropped 5% (from 19% to 14%) according to a quality improvement report developed by Nina Bracken, APN, who provides care in the ROLD clinic. Programs to reduce hospital readmissions should include efforts to promote patient self-management skills specific to COPD, including appropriate use of medications (e.g., inhaler devices, supplemental oxygen), smoking cessation, and pulmonary rehabilitation. A rigorous evaluation of different approaches, including engaging caregivers, peers, and community health workers is needed. Patients hospitalized with COPD exacerbations commonly have several clinically significant co-existing chronic and acute conditions (e.g., cardiovascular disease, pneumonia and mental health disorders). Results of studies suggest that co-existing disorders contribute to hospital readmissions more often than does a respiratory deterioration due to COPD. 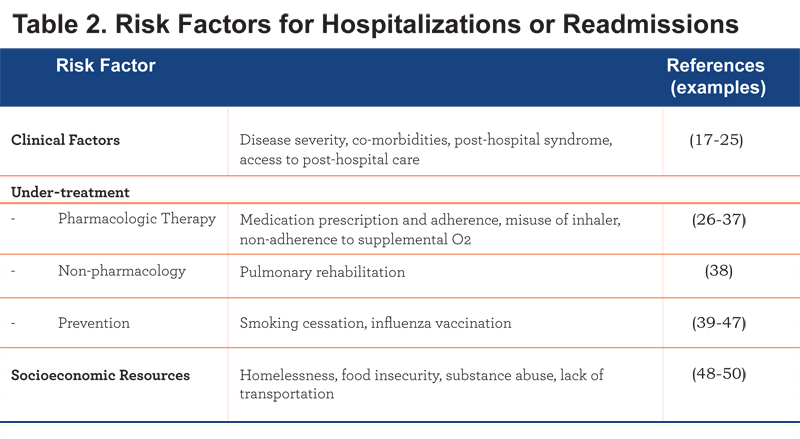 Strategies to reduce hospital readmissions in this population therefore need to adequately account for co-existing disorders during and after hospitalization. 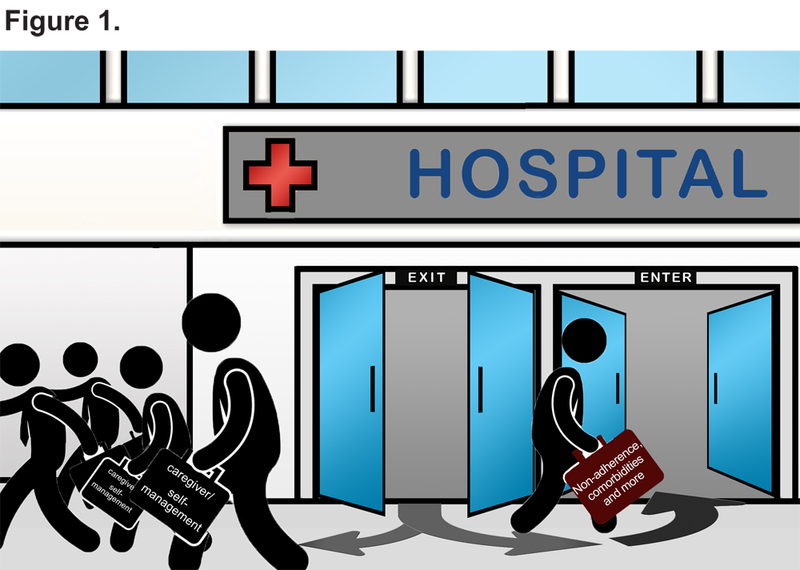 Efforts to reduce hospital readmissions may be harmful. The only study conducted in the United States demonstrated excess risk of death in patients assigned to a comprehensive care management plan.71 This observation highlights the need for appropriate monitoring of adverse events (including readmissions to other hospitals; out-of-hospital deaths) when implementing strategies to reduce hospital readmissions in patients recovering from COPD exacerbations. A variety of hospital readmissions reduction programs are being implemented across the United States. A strategy to connect groups who are engaged in developing, testing, and implementing programs to reduce hospital readmissions is needed. The COPD Foundation has established a learning collaboratory to share best practices and to identify opportunities to inform the development of multicenter studies. The authors thank the COPD Foundation staff for their assistance in convening the National COPD Readmissions Summit and preparing this article. The authors acknowledge that a freelance writer was engaged to assist in compiling information and notes to be used in the creation of this manuscript. VP-C and FZ are supported by an institutional National Institutes of Health T32 institutional training grant (2T32HL082547), JK and HAG are supported in part by Patient-Centered Outcomes Research Institute contracts IH-12-11-4365, CE 1304-6490, and PPRN 1306-04748. 1. Centers for Disease Control and Prevention (CDC). National Center for Health Statistics. Deaths: Final data for 2009. Natl Vital Stat Rep. 2011; 60(03):1-117. 2. Agency for Healthcare Research and Quality. HCUPnet: Online query system based on data from the Healthcare Cost and Utilization Project. HCUPnet website. http://hcupnet.ahrq.gov. Accessed August 5 2014. 4. National Heart Lung and Blood Institute Fact Book, Fiscal Year 2012, Chapter 4-Disease statistics. National Heart Lung and Blood Institute website. http://www.nhlbi.nih.gov/about/factbook/chapter4.htm. Published 2012. Accessed August 5 2014. 6. Medicare Payment Advisory Commission. Report to the Congress: Promoting Greater Efficiency in Medicare. Washington, DC: Medicare Payment Advisory Commission; 2007. 9. Boston University Medical Center, Boston University School of Medicine. Project Red (Re-Engineered Discharge)website. http://www.bu.edu/fammed/projectred/index.html. Published 2014. Accessed August 5, 2014. 10. Penn Nursing Science.Transitional Care Model website. http://www.transitionalcare.info/ . Accessed August 5, 2014. 12. Project Boost mentored implementation program. Society of Hospital Medicine website. http://www.hospitalmedicine.org/boost/. Accessed August 5, 2014. 20. Baker CL, Zou KH, Su J. Risk assessment of readmissions following an initial COPD-related hospitalization. Int J Chron Obstruct Pulmon Dis. 2013; 2013:551–559. 28. Poole PJ, Black PN. Mucolytic agents for chronic bronchitis or chronic obstructive pulmonary disease. Cochrane Database Syst Rev. 2006;(3). 34. Robinson T. Living with severe hypoxic COPD: the patients' experience. Nurs Times. 2005; 101(7):38-42. 35. Crockett AJ, Cranston JM, Moss JR, Alpers JH. Effects of long-term oxygen therapy on quality of life and survival in chronic airflow limitation. Monaldi Arch Chest Dis. 1999; 54:193-196. 62. Maynard G, Budnitz T, Nickel WK, et al. Mentored implementation: a collaborative improvement model for breakthrough achievement. Jt. Comm J Qual Saf. 2012; 38:301-10. 76. Kanel KT, Elster S, Vrbin C. PRHI readmission brief: chronic obstructive pulmonary disease. Pittsburgh Regional Health Initiative website. http://www.prhi.org/images/stories/docs/PRHI%20COPD%20Readmission%20Brief%20Dec%202011.pdf. Accessed August 5, 2014.